Chili jam... that is where the problem lies, the one I desire is not easily found, every month Andrew drives a 50 mile round trip to market to get me a fix of the most delicious chili jam there is (and they say love is dead?). It is yummy with sausages, cheese, makes a great marinade for chicken, it's even delicious poured over ice cream or american pancakes. Why not buy more than one jar I hear you ask? Well, first of all it doesn't keep too well, and secondly it is really rather expensive. We have just had our first chili harvest courtesy of our lovely friends Emma and Monty from The Walled Nursery in Hawkhurst who kindly sent us some chili plants earlier this year. 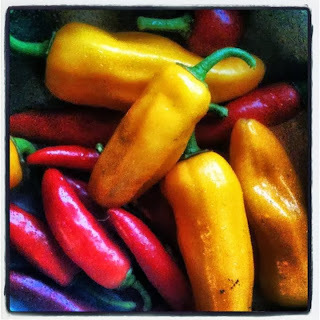 A lovely big bowl of shiny red and yellow chilies; Apache, Cheyenne and Satan's Kiss, hot and fruity and perfect for... 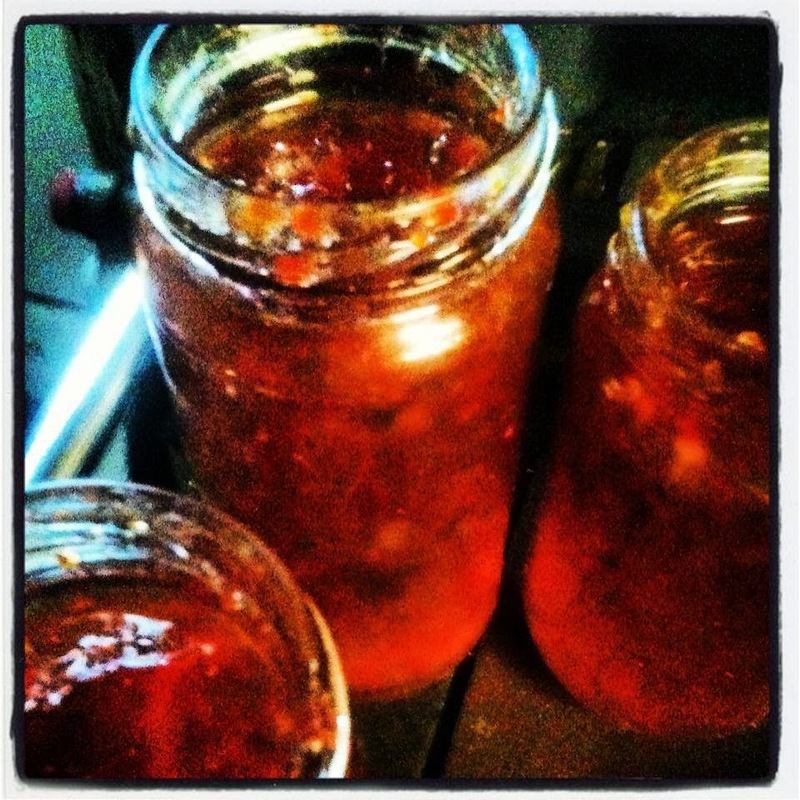 I wonder if I could make chili jam? And do you know? After a few evenings hunting on the internet and through cookery books, and a little bit of tweaking here and there I have found the perfect recipe. I wouldn't say it is the same as my favourite, it is actually better! And because we are that kind of people we are going to share it with you. Put the peppers, chillies, sugar, vinegar and lime juice into a saucepan and heat on a medium heat until the sugar dissolves. Pour the warm mixture into a blender and blend for five seconds. Return the mixture to the pan and bring to the boil, skim off foam that rises to the surface. Stir in the pectin and increase heat to medium until the jam comes to boil. Spoon into sterilized jars. This recipe will make about two normal sized jars or four small olive jars, once cooled lid. Please note this jam will seem very runny at first but will soft set as it cools. Eat on anything and everything.